Juan Atkins has always been, in his own words, “a music lover”. Growing up in Detroit, he would treat his parents’ dinner parties as an opportunity to act as DJ for the night, taking control of the record player to share what was catching his ear as a young, impressionable teenager. This was some years before he would first be exposed to synthesizers and electronic music, and go on to form countless essential partnerships as a producer, DJ, label owner and mentor. It was in 1977 at the age of 15 that Juan would come to own his first synth, a Korg MS10. Having spent some time messing around with the machine in a shop, he eventually persuaded his grandmother to make the purchase, and quickly set about getting to grips with its functions, experimenting and building an arsenal of personal demo recordings far beyond his years. It was when he first heard the music of Kraftwerk, though, during the early ’80s — an act that he describes as an “extension of [the] electric disco” of Giorgio Moroder and others that was so popular on US radio in the previous decade — that things truly started to take shape. That road would eventually lead to Juan forming Cybotron alongside Vietnam War veteran Rik Davies in 1981, with whom he would release one of electro’s most-loved and influential albums, 1983’s ‘Enter’, which spawned such hits as ‘Clear’ and ‘Alleys Of Your Mind’. It’s that project that has brought Juan to London for a few days to talk with DJ Mag, and check in on the progress of the impending first ever Cybotron live show, which is due to debut only a few weeks after our chat. Fresh off a flight from Berlin, where he’s been clocking up the hours in the studio working on new material for the live show and a brand-new album, he shows no signs of fatigue, even with his foot in a cast from a recent injury. Settling down in a tucked-away art studio, Juan gets to grips with exactly why he’s decided to return to the outfit he left almost 35 years ago. “It’s something that’s been sitting at the back of my mind — or shall I say in the alleys of my mind — ever since we started,” Juan responds, when asked why now is the right time for Cybotron to enter the live realm. “There’s something about Cybotron, in the name, that has picked up a cult status over the years.” He says that promoters around the world have repeatedly put in requests for a live show for a number of years. Detroit festival Movement, he explains, seemed to ask every year, but it never felt quite right — until now. After all, he’d already been incorporating classics from the Cybotron back catalogue into the Model 500 shows he was touring festivals with the world over. Work on the live show — which Juan will first present at London’s Barbican before taking it around the world through the rest of this year — began around two years ago when, put simply, the right offer came through. Since then, he and a team of trusty lighting engineers have set out on developing an experience that is as much about the visual element as it is his music. Juan’s coy about the details when DJ Mag asks him — “I can’t tell you everything because it might ruin the surprise” — but before our chat, the team behind the complex lighting system gives us a sneak peek. Lasers will ‘talk to’ over a million individual LED pixels over the course of the show, reacting in real-time to Juan’s every musical move with a maelstrom of colour and lights. It’s taken a lot of hard work to get to this point though, with the lighting team developing entirely new software as well as integrating fresh features into their already existing systems to create a unique show. Juan, meanwhile, has been hard at work building the sound of the show, remotely sending the stems to Cybotron tracks old and new for the technical whizzes to chew over. Writing new music as Cybotron was essential to returning to the project, Juan says. “The idea for the show came first, but I thought, ‘If we’re gonna do this, I don’t want to be playing decades-old tracks only’.” With Cybotron tracks cropping up in his Model 500 live shows over the years, he is keen to mark out this new iteration from what has come before. “We will still play the older music of course,” he’s quick to assure, adding that the material fans know and love will appear in a slightly reworked form. 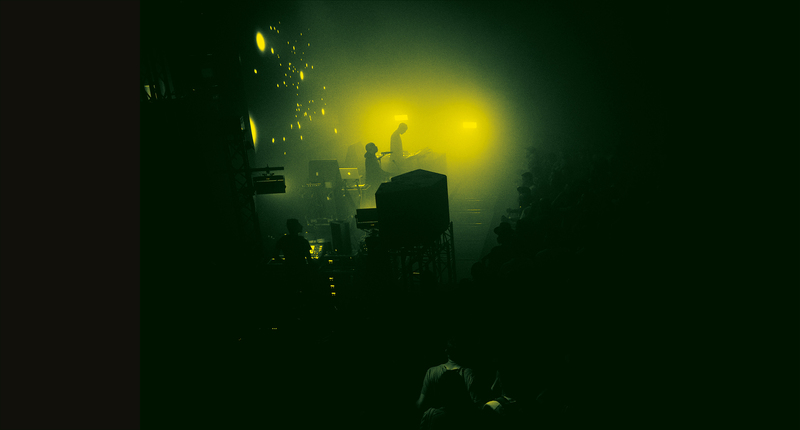 With electro enjoying something of a renaissance in recent years (witness the busy touring schedules of leading figures like Helena Hauff and DJ Stingray), the music of Cybotron feels as relevant as ever. Work on a new album is coming along nicely, with Juan describing the new material, in simple terms, as an updated take on the sound he helped to pioneer. “If Cybotron were one of the frontrunners of that sound, then of course I don’t wanna disappoint the people that loved that music,” he says. At the same time though, he’s “not going into it to replicate Cybotron’s past songs”. He admits, though, that he didn’t see his early work — from Cybotron to Model 500 to launching the essential label Metroplex in 1985 — as belonging to that Afrofuturist tag at the time. “For me, it was just techno music,” he says. “I didn’t get into philosophical reasoning for what it was. It was music born out of technology to me back then. Those early trips to the UK would also give him a chance to school his DJ hero, putting Mojo onto some of the music that he played on Detroit radio in the late ’80s and early ’90s. “We would come back from trips to the UK, and this was as rave culture and the acid and bleep scene was developing,” he says. He’s wary of using the word ‘trendy’, but says that London, and the UK more generally, was more open than the US at that time to new sounds. Trips to the UK would offer he and his Belleville Three cohorts — Kevin Saunderson and Derrick May — an opportunity to experience new sounds first-hand, which they would then introduce to music lovers back home in Detroit. “The Music Institute was a club we would play at regularly, and share some of this music,” he says, adding that Mojo would let the three contribute guest mixes to his radio shows. Juan’s birth city of Detroit is of course essential to his story, and to so many of the musical movements he’s spearheaded. It’s there that he would meet Saunderson and May (the latter through his brother), whom he would go on to mentor and collaborate with extensively. He would also meet Rik Davies while attending a community college in the city, forming Cybotron not long after. The Motor City is still his home to this day, even if his various work commitments continue to see him spend less time there than he did in the early stages of his career. Detroit wasn’t always so open to Juan’s musical ideas, though. “I think we were recognized in Europe, mainly in the UK, before anywhere else in the world,” he says, going on to ask: “How can you be from an American city and have so few people from around America know what you’re doing?” He doesn’t want to seem aggrieved by the slow uptake to his and others’ work in his home city during the ’80s and ’90s, but speaks of a “bittersweet feeling”. “I thank God that whatever forces made it happen, made it happen,” he says, referring to his breakthrough outside of Detroit. That came partly thanks to the inclusion of early Cybotron works on compilations devoted to electro released in the UK during the ’80s. One such release was 1984’s ‘Street Sounds Electro 4,’ which featured the laidback electropop of ‘Techno City’. Juan is open about enjoying the creative process involved in studio time and performing his own music live, more than playing records in clubs. “After a while, the DJ became the headliner, so I had to rethink,” he says. “I still put more capital and value on making my own tracks than playing other people’s.” He diplomatically considers the merits of both his DJ bookings and the various live shows he’s toured, adding that the stress of travelling with records to DJ gigs certainly plays a part in his preferences. “Of course people now can show up with their USB, but I still like to play some vinyl,” he says. The techno you might be likely to hear on an average weekend at one of Berlin’s clubs is somewhat different to the sound that Juan put on the map in the late ’80s, though. A sound that is more stripped-back, loop-driven and functional dominates many of the world’s techno clubs today. Does he feel that the techno scene has become a little too whitewashed in 2019? He’s quick to agree that it has, though is appreciative of the positives that come with the genre’s increased accessibility to producers and clubbers. With synth manufacturers loading their machines with presets, Juan says that many people starting out with production are at risk of not truly testing themselves and their own ideas. “When you find a sound you like, you should ask yourself, ‘How many other people have used this sound?’” he advises. It’s easy for these kinds of discussions to get mired in generational disputes, characterized as a black-and-white battle between the older heads and the new school. Juan, though, isn’t especially bothered about younger people not having a detailed grasp of the music’s history, as long as there’s a willingness to get to grips with it and push things forward. He worries, however, that there’s a growing contingent of people that aren’t so aligned with his outlook. Juan’s commitment to looking forward and continuing to devote time to new projects reminds DJ Mag of the work ethic of another Detroit techno luminary, Jeff Mills, who is also as active as ever over three decades into his career. When asked whether he ever sees himself winding things down for good and stepping away from the spotlight, though, Juan does acknowledge that, if anything, his health could play a role in the decision. “I wouldn’t necessarily say I’d have to slow down,” he says, “but I would say I should take breaths and have some time for myself.” He admits that in the past, his workaholic approach would see him seek out gigs in the cities and places he wanted to visit, rather than simply booking a holiday.